The idea of intercepting negative patient reviews has a positive intention of identifying and understanding patient issues as soon as they occur, and act immediately on fixing them – with a motive to regain the trust of dissatisfied patients (who wrote those negative reviews), and recover them as a patient. Negative patient reviews are bound to happen. Potentially, even a few negative reviews can be damaging for your reputation, if they are not handled carefully. More than that, a negative review also means a dissatisfied patient who needs to be taken care of. By listening to your unhappy patients' concerns and solving their issues, you don't just save another negative review from getting posted online, but also regain the trust of your dissatisfied patients and turn them into your most loyal promoters. Generally, this whole process is carried out under a defined patient service recovery program in any healthcare practice. This kind of proactive approach towards patient recovery helps in solving the patients' issues as immediately as they occur. 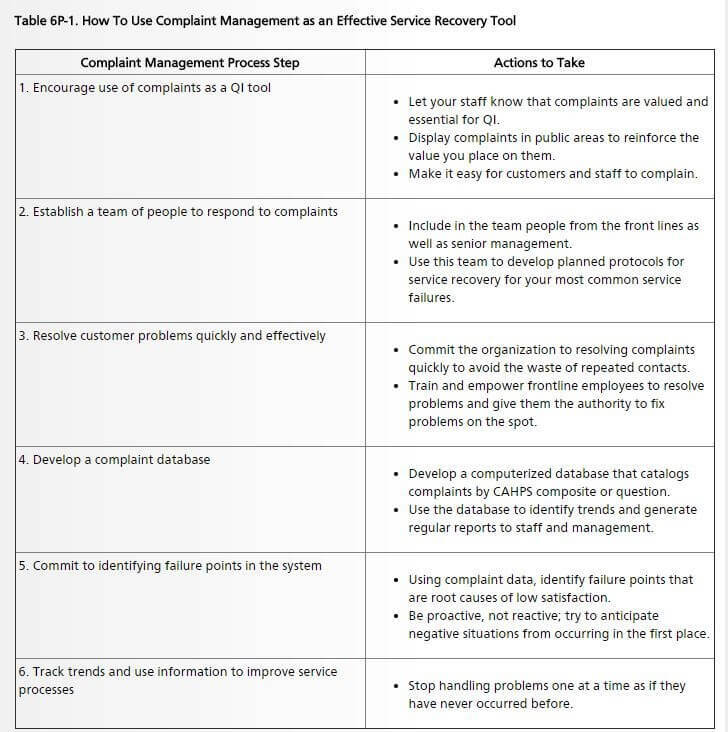 This is in compliance with the process as laid down by the AHRQ (See the screenshot below): Source: AHRQ Steps 1, 2, and 3 talk more about the immediate strategies related to complaint redressal, while steps 4, 5, and 6 are more about the strategies related to using a database of reviews to track and improve the performance of your practice or hospital and its staff, and about how to eliminate the causes of lower patient satisfaction. [Online reputation management tools help in this too] 5. As your unhappy patients' issues will be resolved, the tool will again prompt them to leave a review (most likely, they'll submit a positive review this time which they can directly post on the review website they choose) Here's how RepuGen (a HIPAA compliant online reputation management software) intercepts negative patient reviews, and lets you conduct service recovery for improved patient retention: While using these tools, the only thing that you'll need to take care of is to keep the patient identity or patient health information publicly undisclosed, and you'll never have to face any compliance issues from HIPAA. 3 out of every 4 cases of negative reviews of doctors and clinics are about wait times, grumpy receptionists, parking, etc. Only 25% of the cases are from providers' side, such as bedside manners, proper communication about medicines and treatment, etc. However, that doesn't mean service recovery is the sole responsibility of your front-line staff. “Your front-line staff, to whom patients usually address those complaints, do not necessarily have the skills or resources to fix ’system issues‘ that are often the source of the problem,” says Dr. Wendy Leebov, a national expert on service recovery in healthcare. According to Dr. Leebov, managers and the executive leaders have responsibility for redesigning dysfunctional work processes and systems, or reassigning staff if needed. Intercepting negative review is just the start of the service recovery process. After having identified your unhappy patients and having understood their cause of concern, the next step is to get your team together in solving that issue and recovering the unhappy patient. After all, a strong base of loyal patients is all that your healthcare practice requires for long-lasting success.